Each week on Football FanCast we will be celebrating those special breed who lit up the Premier League with their unique brand of utter genius. This time out we pay homage to a classy midfielder who saved the best until last. In the decade-and-a-half that Gary McAllister played south of the border following his move from Motherwell in 1985 he won the league with Leeds United and greatly enhanced the midfields of Leicester and Coventry too. With all due respect to those clubs though, here we concentrate only on the silky Scot’s two years at Anfield that came after. Because when McAllister left Highfield Road in 2000 it looked for all the world like a curtain call was imminent at a lower league club, perhaps in the guise of player-manager. He was 35, knocking on for 36 and though he’d always been the kind of centre-circle patroller who played much of the game in his head the body tasked with making his vision manifest was notably slowing down. Given that he’d never been blessed with a sprinter’s pace to begin with that was a problem. How much was left in the tank? That was the question and a pertinent one too despite the fact that the classy schemer from Lanarkshire had been an ever-present for Coventry in his farewell season and brilliant too even against his usual high standards. He was 35, knocking on for 36. That was the fact that trumped all others. He was the same age that Jermain Defoe and Phil Jagielka are presently. It was one hell of a surprise then when Liverpool swooped to take him on a Bosman as part of a two-year rebuilding process undertaken by Gerard Houllier that saw the shipping out of the ‘Spice Boys’ replaced by an influx of largely foreign fare. In that summer of a new century McAllister’s arrival was welcomed by Reds who acknowledged his pedigree and anticipated the calming influence he would have on what was a young midfield, save for Dietmar Hamann. Surely though he would be a peripheral figure? 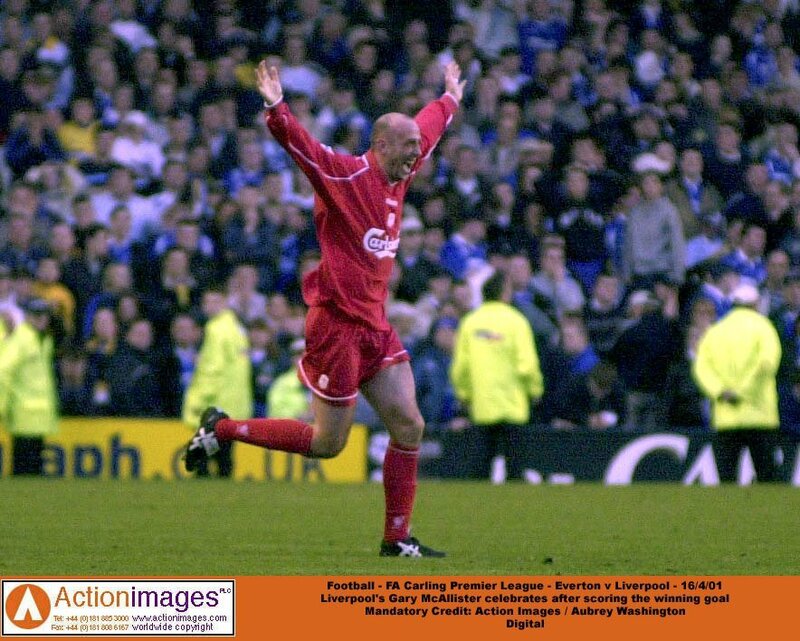 In the event McAllister played 49 times for Liverpool that year, a year in which they won the UEFA Cup, FA Cup and League Cup while achieving their joint highest finish in the league for over a decade. And it wasn’t just his ubiquity that startled. He probed, he orchestrated, he passed and enforced. He was everything great about this emerging side. The following year was much the same and now a reassessment was necessary on the career and reputation of Gary McAllister. Whereas previously he was considered a fine player who had embellished fine sides now he was elevated to an altogether higher plateau. It is always wonderful when such a rare occurrence plays out before our eyes: when a widely admired talent saves the best until last and is finally recognised for the special player he has always been. With McAllister however if felt even more so; that touch more wonderful. Why this is perhaps is down to his integrity and aesthetically pleasing playing style. Perhaps it’s simply down to the man. The man and his free-kicks. On the 16th April 2001 Liverpool journeyed across Stanley Park to take on their nearest and dearest for what turned out to be a classic Merseyside derby. Twice Everton pegged the visitors back, the second occasion via a late David Unsworth penalty and with four minutes of injury time already contested a draw seemed inevitable. That was until Liverpool were awarded with a set piece 45-yards from goal and if that figure doesn’t do the distance justice then factor in that Everton deployed only a two man wall with one of them breaking away for an expected short lay-off. McAllister though had only one intention on his mind. His run-up gave the game away: arcing his stride from the left, all the better to get decent curl and spin from his trusty right boot. Cleverly though this was preceded with pointed instructions for team-mates to get into the box and that worked a treat because it shifted Everton keeper Paul Gerrard slightly over creating a gap at his near post. To reach that gap accurately required a veteran’s touch. To reach it accurately with pace and curve, sufficient to have Gerrard scrambling on foot for a couple of steps before hurling himself forlornly at it, well that needed a slice of genius. For any player to score in such circumstances would ensure they were granted lifelong access into the marbled halls of club legend. That it was McAllister, long in the tooth and classy to the last, made it that touch more wonderful.